This gallery contains just a few of the many hundreds of family group casts we have created over the years - including adult hand and feet casts, sibling hand clasps, mother and child, father and child, grandparent and grandchild casts and larger family ensembles of hands, feet and faces and the currently very popular wreath (ring of hands) casts. You are not limited by the finishes, styles and poses you see in this gallery. Our aim is to create your dream lifecast that is perfect for you, your family and home, so feel free to challenge us with your ideas. For couple hand clasps, for example for brides and grooms or those celebrating anniversaries or engagements, please see our Couples Gallery. For a general PRICE GUIDE for our most popular options please scroll down to the bottom of the page. 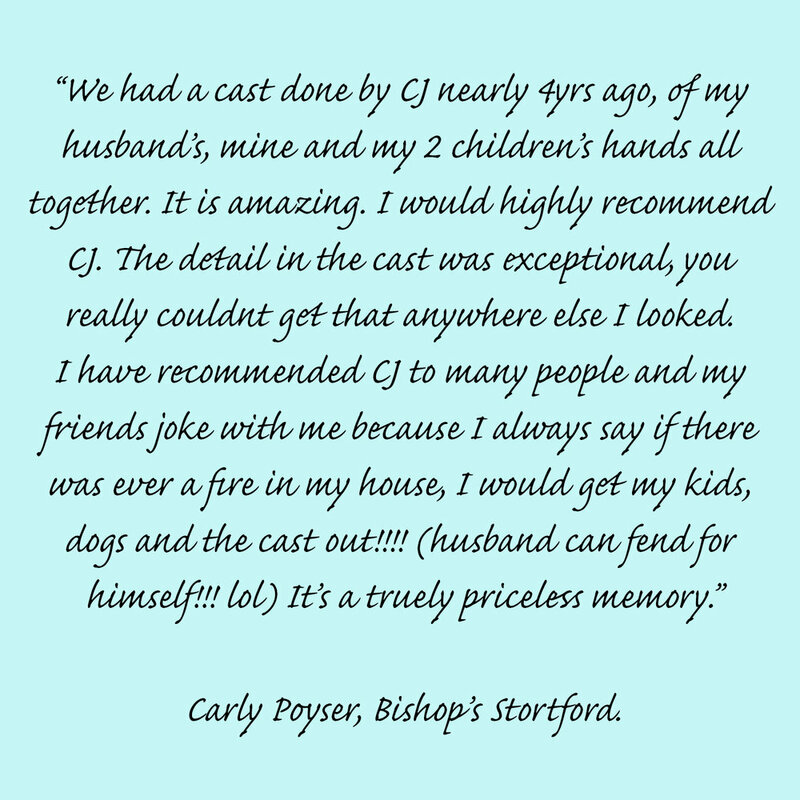 Mixed generation casts or family groups are one of our most popular requests from clients. 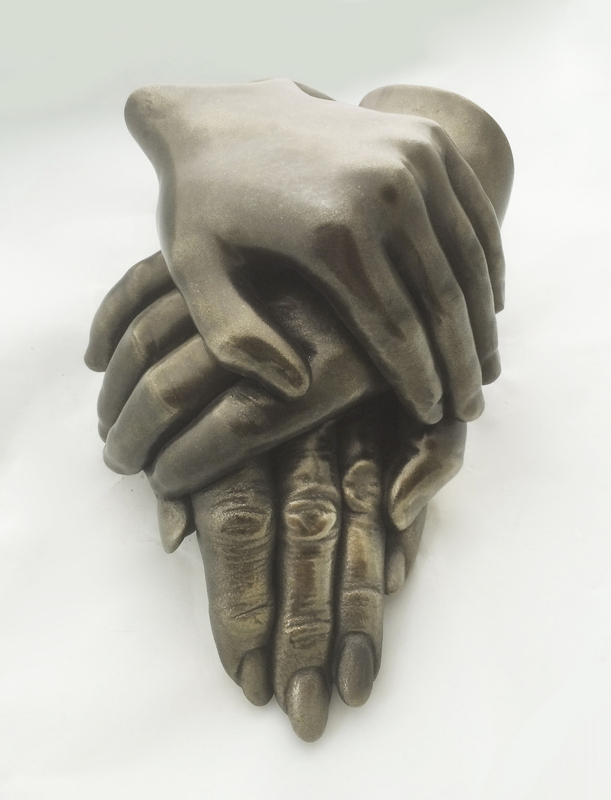 The wonderful contrast between large and small hands, or young and old adds even more sentimental value to the life cast sculpture than a single hand on its own. Capturing not only a moment in time, but also capturing a relationship at that particular time in your family history, to be cherished for generations. 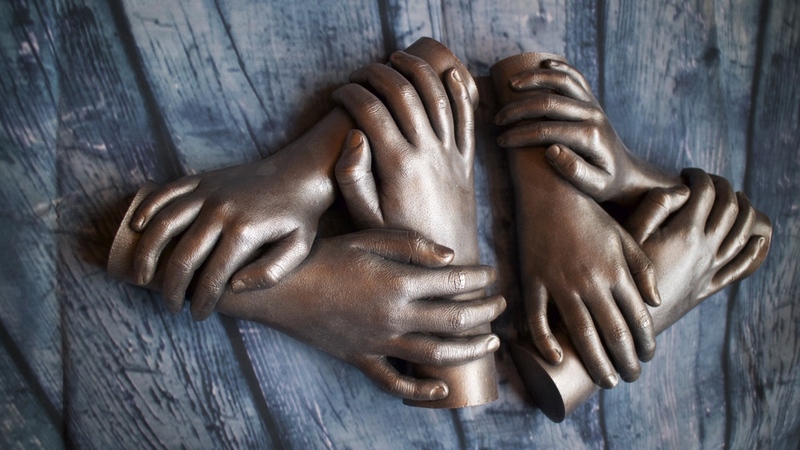 There are endless configurations of hands, feet, and even other more unusual casts that can be cast to represent your special family. Whether it's a row of siblings or cousins as a present for grandparents; or a family group of four,five or more all holding tight to each other; or a more elegant, complex pose...it's your choice. We can even include the family pets! Older children, toddlers, and wriggly babies right up to adults - whether it be parents, aunties and uncles, or grandparents can be cast in bronze, cold cast metals, lead crystal glass, plaster or other materials to create a wonderful single or mixed generation lifecast sculpture, or even a framed group of handprints, also knowing as impressions or imprints. Older siblings holding hands with their new baby brother or sister make the most wonderful pairing. As does the combination of old and young in a mixed generation cast. 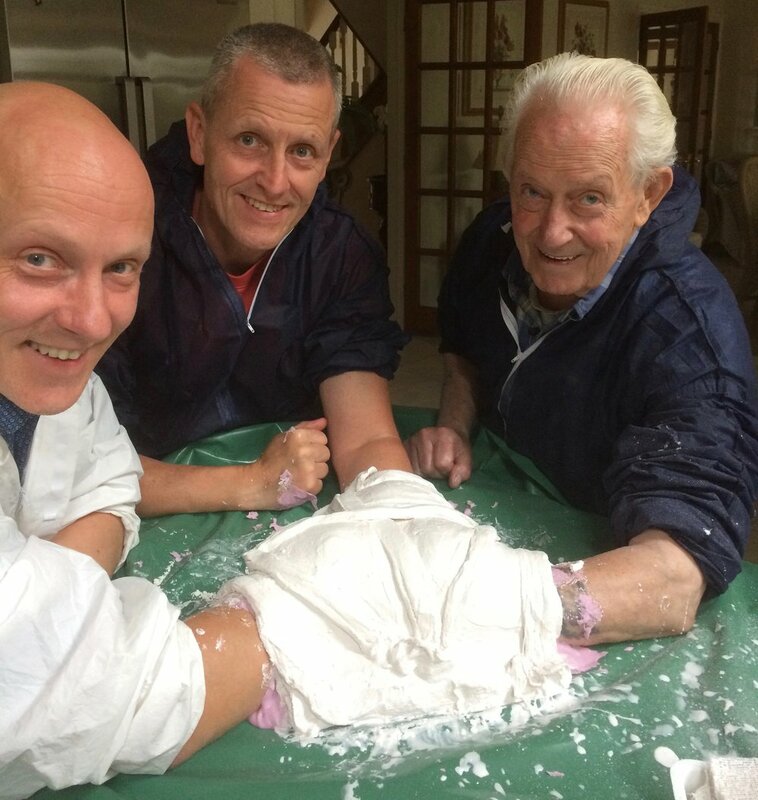 At Rockabelly Lifecasts, we offer hand casting and foot casting for any age group, and can even design a group cast for you where new members of the family can be added in at a later date, should you wish it. Whatever your ideas, speak to us, and we will design a cast that reflects the unique personality of your family members and home to create a piece of art that will be loved and treasured more and more as the years flies by. For a comparison between different popular material finishes, click here. For prices of our most popular finishes and poses, please click the button below. Wreath/family ring of hands casts from £450 for a family of three, £575 for a family of four, £750 for a family of five, £1000 for a family of six and £1200 for a family of seven. Larger groups can be accommodated - POA. Please note that this type of pose requires participants to be able to stay very still for between 20-45 minutes (depending on size of group) so is better suited to well-behaved children over the age of five. However, younger children and even family pets can sometimes be added to the group using a different method for a small additional cost. Contact us for details. For a more detailed family casting price guide for more decorative options and more complex poses such as face casts, plus mounted casts, decorative options with a faux metal finish, and material upgrades in everything from coloured resin, cold cast metals, cast pewter, lead crystal glass and foundry cast bronze please CLICK HERE. For a price guide for single adult hands/feet please click here. To purchase gift vouchers for our most popular combinations, please click here. Or to enquire about booking or ask any questions, click the button below. 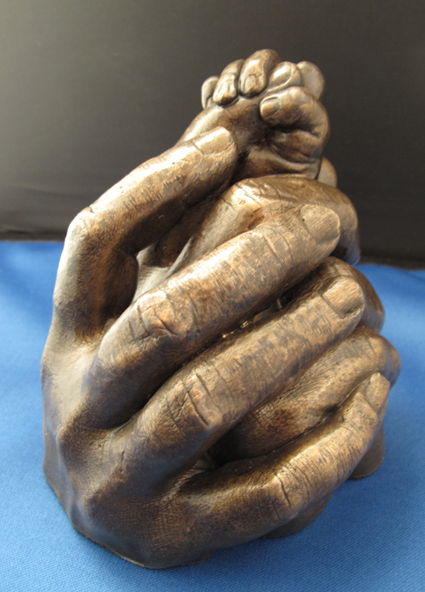 Please note: We are sometimes asked why we don't offer DIY casting kits for family hand casts. There are very good reasons why we don't believe these are a good idea in general. 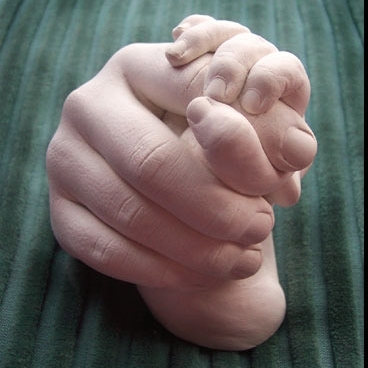 We've written a blog post on why we don't sell baby hand casting kits and pretty much all the same cautions could apply to adult/family group casting kits, so please read the post before you decide whether to go DIY or to trust an experienced professional with your precious family sculpture.